I thought it would be informative to write a history of Meissen blue onion porcelain. I do not think that most people really know how Meissen blue onion dinnerware began, and why it has been so popular for almost 300 years. When you read my blog, you will find the answers to these questions. In the 17th century, the Chinese were known for their perfect blue under glaze painting of Chinese porcelain. These porcelains were sought after and found in many of the wealthiest homes in Europe. It was considered to be very fashionable to have some of these Chinese blue under glaze porcelains in your home. Meissen porcelain from Germany was the first European porcelain. It was discovered in 1710. Before 1710, only the Chinese and the Japanese had the formula to make porcelain. Augustus the Strong of Germany wanted to have the Meissen company sell dinner services and porcelain accessories in the blue under glaze painted patterns like the Chinese were successfully selling. Horoldt, who worked for the Meissen Porcelain factory, perfected the blue under glaze painting of porcelain in 1739. Meissen made many blue under glaze patterns. The blue onion pattern or the "bulb" pattern became the most popular. The Meissen company copied a flat Chinese bowl, which was painted in under glaze blue paint from the K'ang Hsi Period, 1662-1722, as their model for the Meissen blue onion pattern or the "bulb" pattern. This bowl can still be found in the Dresden Museum of Art. The Meissen company had at least seven of their forty painters specialize in painting the under glaze blue patterns. Their most popular pattern was the so called "onion" or bulb pattern. The Meissen blue onion pattern known in Germany as the Zwiebelmuster pattern was also called the "bulb" pattern. In the original pattern on the Chinese bowl, the bulbs or fruits around the edge of the porcelain piece were not onions, but peaches or pomegranates. These are symbols of longevity and fertility in China. On the first pieces, the fruits face inward. On the later pieces, the fruits face outward. As the pomegranates were not a common fruit in Germany, the fruits were changed to represent something more familiar in 1740. As the painting of these fruits was difficult, the fruits started to look like onions. The floral motif on the center of the design was originally a peony, but since peonies were not common in Germany, the floral motif became an aster from the chrysanthemum family of flowers. On the bottom of the design is a bamboo like stalk or trunk which has flowing stems from the flower. Over seven hundred different porcelain pieces with the blue onion pattern have been made by Meissen since 1739. 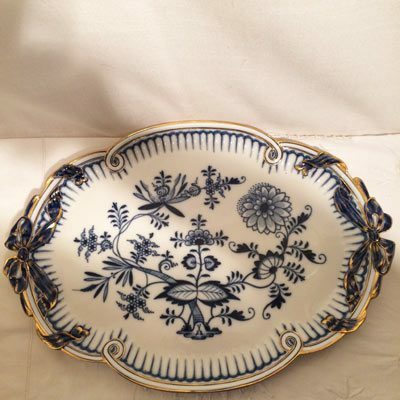 In the mid 1800s, the blue onion pattern was extremely popular and sold well for the Meissen company. 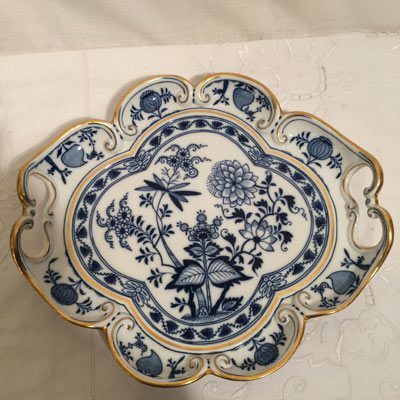 Since there wasn't any copyright for the blue onion pattern and the demand was very high, many European and American companies copied this Meissen pattern. The Meissen Stove and Porcelain Company actually wrote the word Meissen in an oval circle to mark their pieces and other companies used fake sword marks to mark their items. Starting in the year 1888, the Meissen porcelain company put their crossed sword mark in the foot or bottom of the bamboo trunk in order to protect their authentic blue onion pieces. 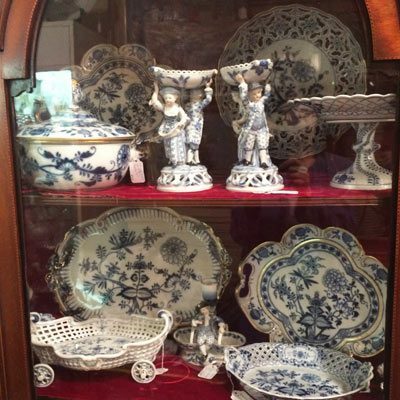 The Meissen blue onion pattern has been a very popular pattern for almost three hundred years. It is still being painted by hand at the Meissen factory in Germany. Although the pieces in a set look the same, they are each a little different because they are hand painted by different artists. The Meissen blue onion pattern can be used for everyday use, for formal use, for a country home or for special occasions or holidays. I have seen people use it formally with elegant tablecloths and sterling silver flatware, and other people use the Meissen blue onion porcelain in a country setting with blue denim tablecloths. Older pieces do not show scratches or grazing because of the Meissen company's superior method of glazing the porcelain. This Meissen blue onion pattern is timeless. People have been using this pattern for decoration and dinnerware for almost 300 years. 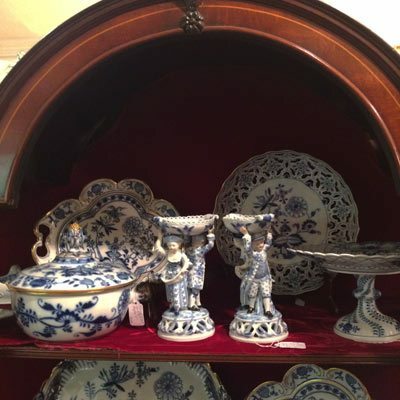 Elegant Findings Antiques has an extensive selection of the original Meissen blue onion porcelain from Germany. 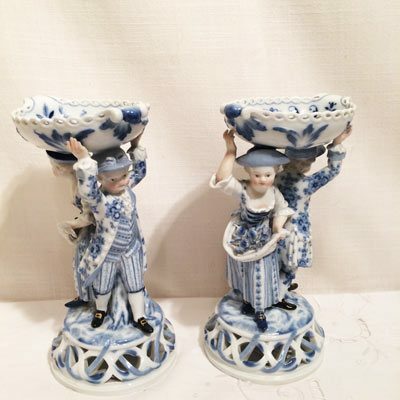 Most of our rare pieces of the Meissen blue onion are from the nineteenth century. 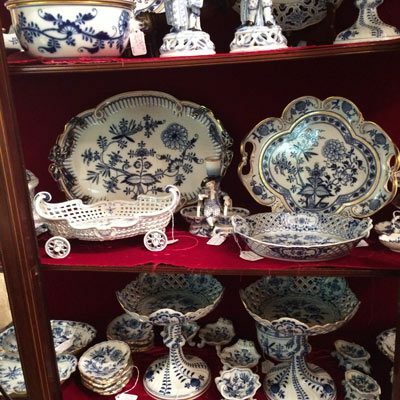 Please look through our many Meissen pages on our website to choose pieces of the authentic Meissen blue onion porcelain for your dinner service or special decorative accessories for your collection.